Grant Dermody (DER-muh-dee) is a harmonica player, singer, songwriter, and teacher from Seattle, Washington. No Depression magazine’s Joe McSpadden called him a “harp wizard with a panoramic view of roots music styles, both old world and new” and indeed, there is magic in what he makes. Now, Grant has delved deeper into the harmonica and acoustic blues with Sun Might Shine On Me. He made a pilgrimage from his native Seattle to Breaux Bridge, Louisiana to capture its 15 tracks, recording with a handpicked band at the studio of revered roots musician Dirk Powell, who played on the record, as well as engineering and mixing it. Converging his own compositions with classics from the Americana songbook, this new disc is no less than a quest – one that connects directly with the sonic soul of the land. Grant’s musical travels have seen him playing with many of America’s most beloved acoustic musicians. Since 2006, he’s toured in the US and Europe and recorded five albums with guitarist Eric Bibb. He also performs live in a trio with Orville Johnson and John Miller, since their 2006 release Deceiving Blues and 2011’s We Heard the Voice of a Porkchop. In addition, Dermody has performed with folk icon Leon Bib and blues legends Honeyboy Edwards, Robert Lowery, Big Joe Duskin, John Dee Holeman, and John Cephas. Guitar maestro Frank Fotusky also continues to be a touring co-conspirator. Sun Might Shine on Me marks a long-awaited encore to 2010’s masterful Lay Down My Burden. That album’s 16 tracks hear Grant and a phenomenal lineup of 26 guest stars – including many of the blues’ elder statesmen — intertwine original songs and timeless covers, a set that displays his pioneering approach alongside of his commitment to the timeless traditions of the blues. Beyond the blues, Grant is passionate about old-time music. 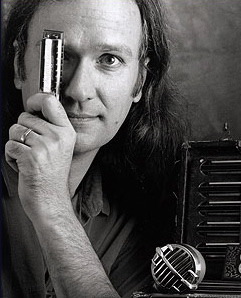 As a member of The Improbabillies, whose 1998 self-titled CD made a serious splash in the old-time world, Grant brought a unique blues sensibility and an innovative harmonica style to that genre. Ask other harmonica players, as well as other musicians, about Grant’s style, and they all point to his big, warm, wide-open tone, his ability to bring his own voice to a wide variety of musical styles, and his willingness and ability to get underneath each song and give it what it needs. Though Grant spends most of his musical time playing in the acoustic world, he never hesitates to plug in and lay down some deep, powerful Chicago Blues. A dedicated mentor of the instrument, Grant has taught harmonica for many years in both private and group settings nationwide to students of all ages. Teaching venues have included Blues Week at The Augusta Heritage Center in Elkins West Virginia, The Country Blues Workshop in Port Townsend, Washington, and Blues Week at The University of Northhampton in the United Kingdom. Grant has taught hundreds of kids in elementary schools throughout the Seattle area how to play the harmonica.